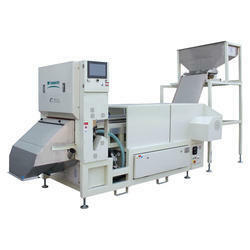 Manufacturer of a wide range of products which include cashew kernels sorting machines. We are the most trusted name in the industry offering a wide assortment of Cashew Kernels Sorting Machines. Our offered products are made with superior quality components & spare parts for high durability and efficiency. They are recommended for the bother free execution and robust structure appropriate to carry out heavy duty performance. These machines undergo various inspections under rigorous conditions for quality assurance at our end.